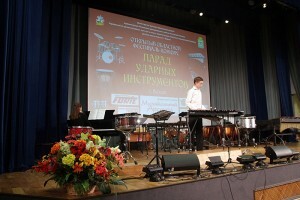 It’s the fourth time when with the active support of the Ministry of Culture of the Moscow region and the Administration of the Lenin municipal area of the Moscow region at the base of the Children’s School of Art in Vidnoe city the wide-ranging festival-competition for drums performers has been held. At the festival almost all kinds of percussion instruments and such kinds of learning as classical, pop-jazz and rock were presented together with percussion. This year it was the first time when the beginning professionals (age group from 19 to 25) has participated in the nomination “Solo on a drum kit”. All the specialists appreciated the high level of the competitors, work of the teachers and the organization level of the competition. For the 4 years the competition has been visited by the performers not only from the Moscow region but from Surgut, Saratov, Engels, Syzran, Tula, Rostov-na-Donu, Nizhniy Novgorod, Asbest, Yekaterinburg, St.-Petersburg, Leningradskiy region, Krasnodar, Dzerzhinsk, Republic of Tyva (Kyzyl city), Republic of Tatarstan (Kazan city) and Moscow. For most of the competitors, it is the second or the third time when they have come to participate and that can tell us a lot about the importance of the competition for them. In 2013 there were 190 participants of “DRUMSFEST” competition: 51 soloists, 25 percussions ensembles, 3 marching ensembles and 30 drum kit performers. They were accompanied by 66 teachers and concertmasters. The arrival of the participants from Belorussia, Ukraine and Estonia was a great pleasure for everybody and that, in fact, makes this competition the International one. The youngest participant was at the age of 5 and the oldest – 25 and he has already become a successful professional. Nevertheless, in the Regulation of the competition there were the rules that had been specified and formulated according to different age categories in every nomination. The nomination “Solo on the orchestral drums” (the level of snare drums, xylophone, marimba, vibraphone, kettle-drums and multi percussion performance) provides 4 age categories: 7-9 years, 10-12 years, 10-12 years, 13-15 years and 16-19 years (music colleges and institutions). In the Nomination “Ensembles of percussions” the groups form music schools (the youngest and oldest group), from secondary specialized music educational institutions and marching ensembles (with the defile elements and work at big open areas) are supposed to perform. There were also battles on drum kits of the age categories to 12 years, 13-17 years and 18-25 years. This year, as for the last competition, there was the second round for the Nomination “Solo on the orchestral instruments”. During the first round the participants perform the compulsory compositions of five-six levels of complexity. During the last competition there was an incident when there was a sixteen-years girl who performed in the nomination for 10-12 years because she had studied only 1 year at the moment of the competition. 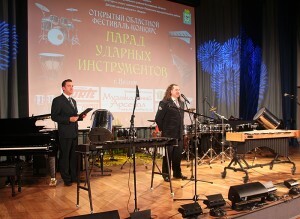 The jury in the nomination “Solo on a drum kit” after the 4th festival has come to conclusion that it is necessary to make some changes in assessing the competitors. First, it is necessary to increase the number of age categories. It is impossible for a 18-years old drummer to compete with a successful 25-years-old professional. Second, it was noticed that there were some differences in manner and character of performing on a drum kit between boys and girls. Here we have strength, attack, especially on a bass-drum, and the way of thinking itself in solo variations. So, next time the charming ladies will compete in a separate nomination. Everybody knows that the level, competence and the attraction of the competition depend on the jury members. 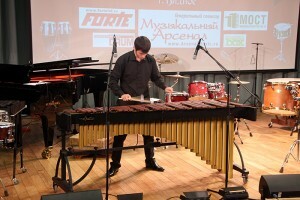 In Russia almost all the competitions for drums students at children’s music schools and lycees, colleges at area, regional and even All-Russian level are carried out together with the performers on brass instruments. So, naturally, there is at least one member of jury who is a percussion instruments specialist. The rest of them – brass specialists. Moreover, objectivity doesn’t always correspond to the desirable level. 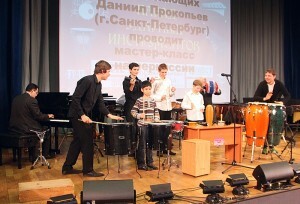 So, only professional percussion instruments performers were invited to be members of jury in “DRUMSFEST”. Every nomination will be assessed by the specialists of their specializations: classical orchestral, ensembles, pop-jazz and modern arts. And the judges are the musicians that have great importance and authority among Russian professionals and teachers. We can assure you that the jury if one of the reasons why “DRUMSFEST” is competent and fair. A great surprise for everybody was the presence of a special jury member. 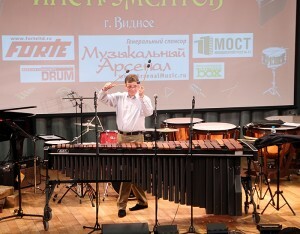 Danil PROKOPYEV – a young, talented but already successful as a specialists in modern, untraditional rhythms on percussion not only in Russia but abroad – in a moment he accepted our invitation to participate in our competition as a member of jury and carry out great master classes. As practice has shown, ensembles of different genres came to every competition, so the repertory was extremely variegated: from classics to afro-, latin- and even modern rock and jazz compositions. And Danil Prokopyev’s experience came in useful when assessing the percussions ensembles. The master classes were organized by Danil Prokopyev together with Gumbi Ortiz (percussionist of Al di Meola), Columbian singer Toto la Momposina, Brazilian All Stars (including Andrey Kondakov), percussionist Cesar Granados (Munich). 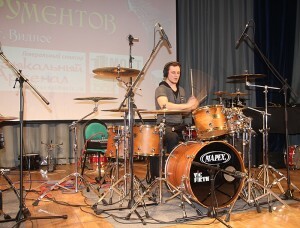 In 2004 he organized drums-percussions school «SPb Percussion Club». Through studying the traditional rhythms and songs of Cuba, Brazil and Western Africa students learn to play the traditional afro-cuban instruments: congo, bongo, timbales and others. In autumn 2006 he became one of the co-founders of the first Russian drums-percussions magazine «Community DRUM». Nowadays Danil is a drummer at St. Petersburg band “Marksheider Kunst” where musicians play SKA, Latin Jazz, afro-cuban and Brazilian music, funk etc. He is also the official artist of MAPEX, Tycoonpercussion, Masterwork, Vic Firth, Roland, Evans. We would like to thank Danil Prokopyev for the easiness he accepted our invitation with and, through his magazine, he also provided the festival with the infotainment. The organizing committee of the festival also express our gratitude to all who were with us during the three days of the festival: participants, teachers, concertmasters, the jury, all the guests of the festival and the sponsors without who wouldn’t be able to hold the festival. As during all the years of the competitions, the company “Muzikalniy Arsenal” gave us great support together with the company “FORTE”, which provided many wonderful prizes for the winners and laureates. We are waiting for everybody in 2014 at the next “DRUMSFEST” which, we hope, will get the All-Russian and even more – International status!